The most common deficiencies are those of nitrate, phosphorus, potassium, iron and magnesium. These elements should be on top of the list of elements responsible for bad condition of our aquarium plants. This article also does not contain the most important macro – C. The detailed blog on CO2 in fresh water tanks can be found here soon. An accurate identification of micro and macro elements deficiencies on the basis of plants’ visible symptoms is very difficult and requires a lot of experience. The symptoms very often are similar to each other. What is more, symptoms of the same element deficiencies can be different depending on the level of deficiencies and the type of plant they affect. The identification gets even more complicated when more than one deficiency or excess is present at the same time. It also needs to be borne in mind that not all of the worrying changes in the plants’ looks and condition are the result of inappropriate fertilising. These can be caused by insufficient level of lighting, toxicity of some medications introduced to the tank, or simply by mechanical damage caused by fish or snails. You need to be, therefore, cautious when making your judgement about the symptoms of deficiencies or excesses. Identification of deficiencies and excesses needs to be based on a careful observation of plants. Both the young and older leaves need to be observed carefully. An observation of the roots’ condition may be also informative; not only those roots that are in the ground (substrate), but also those growing out of the internodes. The typical symptoms of deficiencies and excesses occuring on leaves are chlorosis and necrosis. Chlorosis is caused by a decreased level of chlorophyll, and it is characterised by a change of colour from green to light green, yellow or even white. In case of plants of red colour, leaves turn light pink. There are different types of chlorosis: spot-like chlorosis, general chlorosis (affecting the whole leaves), edge chlorosis (affecting the edges of the leaves) and interveinal chlorosis (affects the areas in between the veins; veins remain green). Necrosis, on the other hand, is characterised by decay of parts of the leaf blades, in tanks, necrosis causes holes in the leaves. It often happens that plants don’t have enough of all of the microelements and those that are dosed cannot be successfully absorbed – this is described by the Liebig law of the minimum – that the plants’ growth is dictated not by total resources available, but by the scarcest resource. This minimum resource – that is the element, leads to limiting of the effects of other elements and in consequence this leads to lowered growth and development of plants. Topping up these deficiencies will make plants grow better and faster. This is why it is so important to observe your plants and base your judgement on the visual deficiencies and symptoms in order to be able to provide your plants with what they need. This article is based on pieces of information derived from various scientific sources, years of observations confirmed by many also experienced fish keepers and aqua plants enthusiasts. Nitrogen is a macroelement, it makes about 1.5% of a dry plant. Nitrogen is a component of proteins, nucleic acid and chlorophyll. Nitrogen is a mobile element (can transfer from one part of the plant to another), therefore symptoms of its deficiency occur in older leaves first. Plants absorb nitrogen in the form of ions NO3-, NO2-, NH4+ and urea. Water plants absorb nitrate first of all in the form of ammonium cation, as its absorption requires the least energy. Ions NH4+, however, are toxic for fish and stimulate the growth of many algies therefore are not recommended for use in planted aquariums. The most commonly used source of nitrate is KNO3 (Potassium Nitrate). The recommended level of nitrates is 5-30 ppm. The nitrate level needs to be monitored regularly (at least in the first few months since the aquarium’s been set up). Well-lit aquariums with CO2 injection (even in those with a big fish population) often need nitrate supplementation. The usual dosing ranges from 5 to 25 ppm NO3- a week. In planted tanks nitrate deficiency is quite common. Low nitrate level (close to deficiency level) in red plants leads to intensified colours. In case of moderate deficiency usually the only symptom is an impeded growth of the plants. In case of more severe deficiencies the growth is completely blocked. Also, smaller leaves, smaller propagation and general chlorosis of older, and with time younger, leaves (indicated by light-green to yellow colour) are typical symptoms of nitrate deficiency. In more severe deficiencies, necrosis and fall of leaves occur. Leaves and stems of some plant species become red or orange. In case of some plants (e.g., watermillfoil, hornwort, ditchmoss) stem fragmentation may also occur. Symptoms of nitrogen deficiency (e.g., chlorosis) may be mistaken with the symptoms of potassium deficiency – to find out with which element’s deficiency you have to deal, you can dose nitrogen as plants react very quickly to it. Also, plants tend to dwarf if they don’t have enough of nitrogen, which is not the case in potassium deficiency situation. In planted tanks excess of nitrate is quite unlikely. Possible symptoms of excess levels of nitrate can be visible on the whole plant. Leaves become dark-brown and blossoming is inhibited. Phosphorus is a macroelement, it makes about 0.2% of a dry plant. Phosphorus is a component of nucleic acid and phospholipids; it plays a key role in cells’ energy processes. Phosphorus is a mobile element, therefore symptoms of its deficiency occur in older leaves first; although other sources suggest the symptoms occur in the whole plant. Plants absorb phosphorus in the form of ions H2PO4(-) i HPO4(2-). The most commonly used sources of phosphorus are: potassium dihydrogen phosphate (KH2PO4) or di-potassium hydrogen phosphate (K2HPO4). The recommended level of phosphorus is 0.5 – 1 ppm; some aquarians believe the perfect level to be approximately 2 ppm. The level needs to be monitored regularly (at least during the first couple of months since the aquarium set up). Well-lit aquariums with CO2 injection (even in those with a big fish population) often need phosphorus dosing. The usual dosing is approximately 1 ppm PO4(3-) a week. In planted tanks phosphorus deficiency is quite common. Often the only symptom is an impeded growth of the plants (in more severe deficiencies the growth is completely blocked). Another often occurring symptom of phosphorus deficiency is the decrease of the size of the blades. The symptoms usually occur in older leaves, but with time they can spread to the younger plants too. Leaves become dark green, purple-lilac (stems may be affected too) or retain their normal colour. In some cases, the tips of the leaves become brown and wither, sometimes they fall. Blossoming may be also inhibited. Another symptom noticeable in aquariums may be the lack of photosynthesis (no visible bubbles despite of a good level of light and CO2) and increased growth of green algae on leaves and glass. Sulfur belongs to a group of macroelements, it makes about 0.1% of a dry plant. Sulfur is a component of proteins and coenzymes. Sulfur is a moderately mobile element, therefore symptoms of its deficiency occur on young leaves first; although other sources suggest the symptoms occur in the whole plant. Sulfur is absorbed by plants in the form of sulfate ions SO4(2-). In tanks is rather unlikely. Most resources mention that chlorosis of young leaves (that become light green or yellow). Such symptoms often occur on the whole plant too. In some cases the tips of the leaves may turn yellow and bend downwards. According to other sources, there is a possible decrease of growth and leaves fall. Possible symptoms are inhibition of growth, decrease of leaf size. Also, other symptoms: interveinal chlorosis as well as browning of the edges of the leaves with occasional spreading towards the leaf blades. Some sources report negative impact of high concentrations of sulfur (approx. 100 ppm) on moss. Many sources and reports of experienced fish keepers, however, suggest that sulfur has no negative impact on plants’ growth. Some fish keepers even reported no problems in their tanks when their level of sulfur was as high as 200 ppm. Potassium is a macroelement, it makes about 1% of a dry plant. This element activates over 50 enzymes, takes part in osmoregulation and in ion balance maintenance. Potassium is a mobile element, therefore symptoms of its deficiency occur in older leaves first. Plants absorb potassium in the form of ions K+. The most commonly used source of potassium is potassium sulphate (K2SO4) and potassium chloride (KCl). The recommended level of potassium is from 5 to 20 ppm a week. 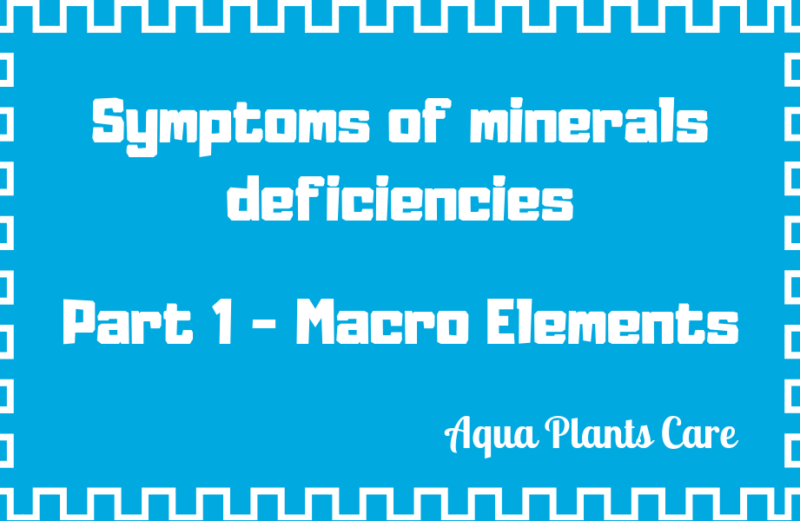 In planted aquariums, in which this element is not provided, there is a high likelihood of its deficiency. Tap water doesn’t contain enough of this element to meet the plants’ needs. When it’s necessary to dose KNO3 to maintain a good level of nitrates, further dosing of potassium would not be necessary. In planted tanks potassium deficiency is quite common. In case of moderate deficiency usually the only symptom is an impeded growth of the plants (in more severe deficiencies the growth is completely blocked). Chlorosis of older leaves’ tips and edges, often leading to their necrosis, in more severe cases, potassium deprivation spreads to the leaves’ blades (the main veins remain live however). In other cases, yellow, brown or white spots, also leading to necrosis, appear on plants’ leaves. Potassium deficiency also manifests itself in chlorosis between the veins throughout the whole leaf blade. Some sources also suggest symptoms such as growing points withering, fragile sprouts, poor development of root system and leaf fall (in more severe cases). The most often mentioned effect of excessive potassium is magnesium or calcium deficiencies. Other sources also indicate manganese, nitrate, zinc and iron deficiencies. Some sources suggest that excess of potassium is harmless. Some aquarists providing high doses of potassium (20 ppm a week or more) noticed young leaves deformations and growing points withering. Such problems were particularly evident in Ammania Gracilis or Eusteralis Stellata plants. Calcium is a macro element; it makes about 0.5% of a dry plant. Calcium is an activator of many types of enzymes, is a component of cell wall, it also plays a crucial role in regulating cell processes. Calcium is a non mobile element therefore its deficiency symptoms are usually visible in growing points and the youngest leaves. Plants absorb calcium in the form of ions Ca(2+). Calcium deficiency is rather uncommon, possible only in very soft water. Indicators of calcium deficiency are: severely impeded growth (also affects roots), growing points decay (in serious cases), chlorosis (on the edges or general in the form of spots), young leaves size reduction and deformation. Other sources indicate that leaves become brown. Furthermore, necrosis of points and young leaves’ edges is possible. Calcium excess in itself is not toxic, however it makes the absorption of many elements more difficult for plants. This may cause deficiency of magnesium and borum, other sources also report deficiencies of phosphorus, potassium, iron and zinc. Therefore very hard water may require increased fertilisation of some micro elements. Magnesium is a macroelement, it makes about 0.2% of a dry plant. Magnesium is a component of chlorophyll; it also activates many enzymes. Some sources classify magnesium as a mobile element (can transfer from one part of the plant to another), therefore symptoms of its deficiency occur in older leaves first. Plants absorb magnesium in the form of ions Mg(2+). In case of this element, its level is not as important as its proportion to calcium. The most commonly used source of magnesium is magnesium sulfate heptahydrate (MgSO4x7H2O). Interveinal chlorosis (sometimes in the form of spots) first occurs on tips and the edges of the leaves, then it spreads to the center of the blade; the leaves’ veins tend to remain green. With time the deficiency symptoms may also spread to younger leaves. Other sources suggest that deficiency symptoms most likely occur in upper and middle leaves. The areas affected by chlorosis may also change the colour from yellow to brown (or even lilac and red). In the case of more severe deficiencies, necrosis and leaves withering may occur. Sometimes leaves may start to fall even before other symptoms (e.g., change of colour) are noticeable. Some sources suggest that young leaves may become bent and their size may decrease.